A special LITHOFIN product developed for professional use. This mildly alkaline special cleaner consists of highly active components with an abrasive effect resulting from nano particles. The gel is easy to use, scented and creates no aggravating or harmful fumes. To remove stubborn/deeply engrained dirt and for the intensive cleaning of ceramic tiles and natural stone such as granite and similar hard stones. For indoor and outdoor use. Ideal for removing the transportation protective coat from porcelain tiles. 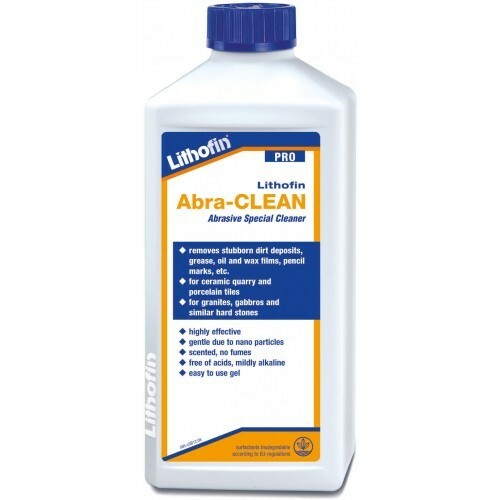 Lithofin Abra-CLEAN can be added as an intensifier to other (non-acidic) cleaners: Apply chosen cleaner, add approx. 20-50% Lithofin Abra-CLEAN and mix by brushing. A careful rewash is necessary.